Update 13 July 2017: interesting questions posed (in Turkish) by veteran Gallipoli tour guide, journalist and author, Gürsel Göncü, who has seen the renovation plans document. Göncü says, roughly, that the plans look fine on paper but lack clarity on how to correct the errors created and damage done by piecemeal construction and commemoration over many years at Gallipoli. The article appears in a blog wrangled by Tuncay Yilmazer. The news that the Turkish memorials at Gallipoli are being renovated or refurbished or restored has caused a minor flurry in Turkey, Australia and New Zealand. This post gives some background and offers – respectfully – some options for President Erdoğan to consider. Our post early on Friday (16 June) publicised the story, although it had been live on Twitter for a while before that. (That post includes one version of the ‘Atatürk words’ around which this article also revolves.) Paul Daley wrote it up in Guardian Australia later that day, and the New Zealand Herald had a piece the next day. We had tried on the Thursday to get clarification from the office of the Minister Assisting the Prime Minister for the Centenary of Anzac, Dan Tehan, and from the Australian Consulate in Çanakkale. The Minister’s office seemed nonplussed but followed up. We also emailed a question to the Turkish Embassy in Canberra . Despite the advice from the Minister’s office and the Embassy that something was under way, it was still unclear what the something was and why it was happening. The words being used – refurbishment, renovation, restoration – all meant something slightly different. It was not until around 1.00 am AEST today Sunday – and after Paul Daley’s Guardian article had attracted more than 400 comments and 800 Facebook shares, our website post had been viewed more than 600 times, and a good few tweets had been tweeted by various people – that an official statement appeared on the Facebook page of the Çanakkale Savaşları Gelibolu Tarihi Alan Başkanlığı, the Directorate of the Çanakkale Battle and Gallipoli Historic Site, a body established in 2014. There has been misunderstanding and rumours in some media outlets regarding the Turkish monument at Arıburnu. The monument at Arıburnu is not being destroyed or altered. The stonework has been removed due to deterioration that has occurred over the years, and will be restored and replaced. Totally fifteen (15) similar monuments on the peninsula are also being restored in the same way as part of a programme. With regard to these monuments, history is not being destroyed or rewritten, and Ataturk’s words will not be lost. The wording will be the same as in the past. Beside that you can see the photo of monument at Arıburnu when the restoration is completed. Leaving aside the work on the other Turkish monuments, there we have it for the Atatürk Memorial: restoration of the stone facings with the same inscription. We saw some rather huffy Twitter posts from the Australian and New Zealand Ambassadors to Turkey, criticising people for conjecture. We pointed out to both Ambassadors that they should have known what was happening at Gallipoli and made this information public, given the Australian and New Zealand interest in events in this part of Turkey. 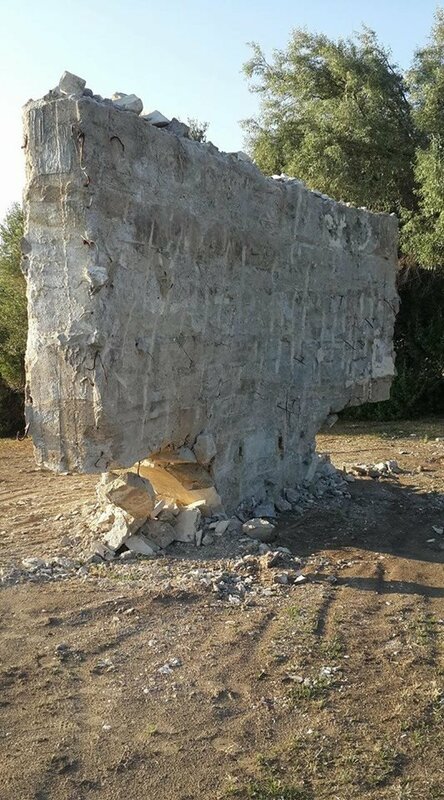 Now today we hear the sad news that Ataturk’s famous words, set in stone “For the mothers who sent their sons” speech memorial on Anzac Cove has been destroyed … The authorities do as they please without any checks and balances, quite often to achieve some political symbolism. The local operators as should everyone be notified weeks if not months in advance. Can you imagine if people just spent 22 hours flying here and looking forward to seeing this significant part of the battlefield, only to be told, “Oh they destroyed it yesterday, without any notice and will rebuild it”. To all of those concerned about the “restoration” work being carried out on the Ataturk Memorial at Ari Burnu. We are happy to announce that the authorities have now posted, in English (a month after ripping into it) that work will begin to restore the monument as part of a project to restore 15 monolithic inscription memorials. The work will take some 250 days and I’m happy to say that the Ari Burnu site now has scaffold and signage informing people of the work … a month too late. But is that where it should be left: a long-running refurbishment project behind misspelt and hastily erected signs, with well-known memorials – 14 others as well as the Atatürk one – in a state of undress as visitors, Turkish and others, troop through? Well, maybe not. 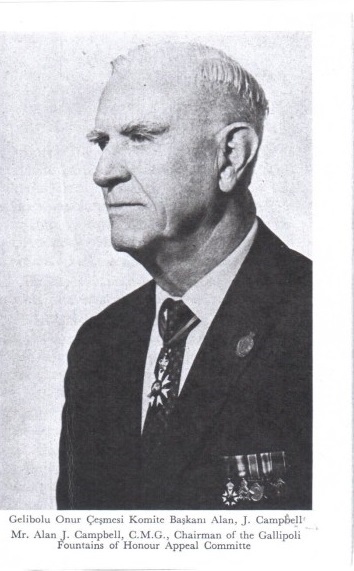 It would be a pity not to use this hiatus to remedy some historical errors. Let’s look, as an example, at three options for the Atatürk Memorial. 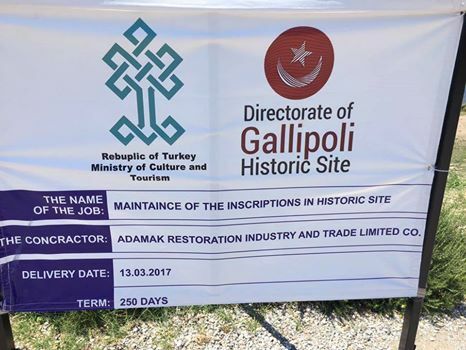 This option assumes that the project proceeds as the Gallipoli Directorate says it will: the Atatürk Memorial will have its stone facings replaced and the existing inscription will go back up. This outcome will be welcomed by battlefield tour companies – who will be able to stick to their current patter about how the ‘Atatürk words’ came to be said (or perhaps written) – and by diplomats who recall the terms of the original deal between Australia and Turkey (mutual renaming, memorials in Australia and Turkey). On the other hand, retaining the status quo would not be welcomed by some Kemalists (like Ergün Aydoğan in 2010) who resent the idea that Atatürk saw Johnnies and Mehmets as equal, and by some Islamists who resent the idea of Atatürk, full stop. Historians who have looked at the provenance of the words would also regret a lost opportunity to move the myth closer to the evidence. This change would solve the Kemalists’ problem noted under Option 1 above. Anti-Atatürk Islamists would benefit by default. But the same argument about provenance could be applied to the rest of the alleged Atatürk words. Honest History’s extensive research – go to the Talking Turkey thumbnail or to this brief summary – shows that there is no strong evidence that Atatürk ever said or wrote the words. On the other hand, there is strong evidence that the words were invented, 15 years after Atatürk’s death, by his former associate, Şükrü Kaya, and that their promotion since (particularly during the years 1978-85) can be explained by the exigencies of Turkish politics and diplomacy (with the assistance of some fairly gullible Australians and New Zealanders). If someone was inclined to bite the bullet, so to speak, Option 2 would leave us with the existing words, minus Johnnies and Mehmets, and an attribution to Kaya rather than to Atatürk. The problem with that outcome would be Kaya’s unsavoury history, which included probable involvement in the Armenian Genocide from 1915 to 1918 and ethnic cleansing of Kurds in the 1930s. Any other attribution though, such as ‘Once believed to have been said or written by Atatürk but now we aren’t sure’, would look rather messy. In any case, implementing this option would mightily upset those who are used to and who benefit from the sentimental ‘Atatürk words’. The people responsible for the change would be told they were shooting Santa Claus or accused of perpetrating an Islam-equivalent sacrilege. Given the Islamist bent of the Erdoğan regime, some observers have wondered whether the current restoration is a prelude to replacing historic inscriptions with something like ‘here the Crusaders were again repulsed’. Such a change might appeal to the increasing numbers of Islamist visitors to the site; they are entitled to see something that touches chords with them – if one agrees that chord-touching should be the primary objective of tours to historical sites. 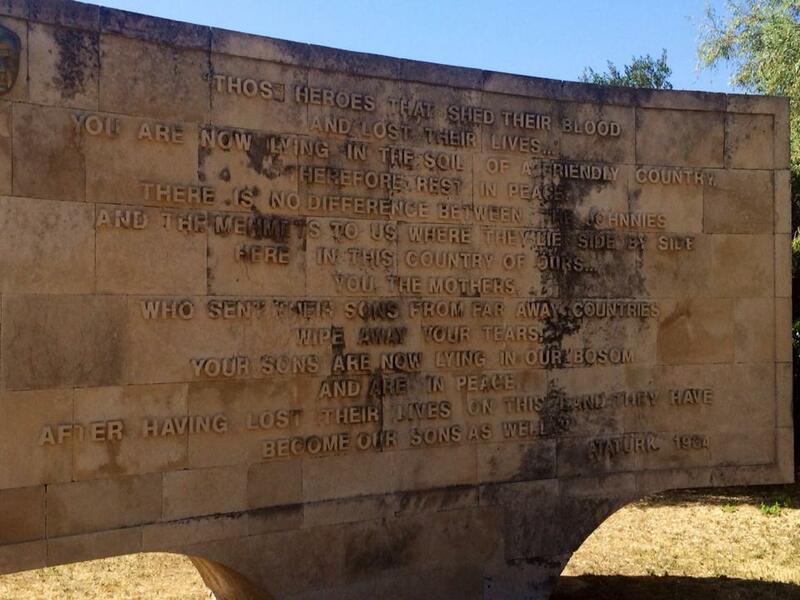 Words like this on the Atatürk Memorial would certainly require battlefield tour scripts for Australian and New Zealand and British visitors to be thoroughly rewritten. As an option, the author offers just four words as a potential replacement inscription for the Atatürk Memorial: ‘Yurtta sulh, cihanda sulh’. The words are Atatürk’s, they date from 1931, and they mean ‘Peace at home, peace in the world’. They were meant to be the basic tenet of Turkish foreign policy but they should be widely applicable. Moreover, unlike the ‘Those heroes that shed their blood’ words, they do not presuppose the prior death of young men and women. And that is a good, forward-looking argument in their favour. Anthony Pym, an academic specialising in issues of translation, described the saga of the ‘Atatürk words’ as ‘a paroxysm of monuments and plaques, all reinforcing each other, with a certitude that creates its own history’. A rough definition of the word ‘paroxysm’ in this context is ‘a recurrent severe eruption’. (The Turkish word is almost the same – ‘paroksism’.) It really comes down to whether sophisticated people in Turkey and elsewhere are happy to add further to the paroxysm or call a halt. As we have said many times on the Honest History website, the words attributed to Atatürk are lovely words but they do not stack up as history and they are not particularly useful in building a peaceful world. There are better ways to commemorate the deaths of 130 000 men, Ottoman and Allies – and to focus on the really important questions, ‘was it worth it?’ ‘did they die in vain?’ – than recycling this tired rhetoric. Why not replace Atatürk’s contested words with these uncontested ones?